Our HMS-80/180 product package is the ideal combination of verge mulcher and hedge shears for your compact tractor. The extension arm is excellent for mowing and mulching embankments, ditches or woods and roadsides. Furthermore, it is perfect for pruning back bushes to the required size. The oscillating Y-type blades of the 80 cm wide mulcher enable a clean cut and efficiently chop up the mowed product. Hedge shears / a sickle bar is also included in the package with a work width of 180 cm, which you can replace the mulcher with as required. This cutter bar provides for a completely easy and time-saving cutting of large hedges and bushes. The material to be cut can have a diameter of up to 2.5 cm. The drive unit is fitted in the three-point hitch of your tractor (Kat. 1 suspension). It has its own hydraulic oil tank with a volume of 55 litres. Now, you merely need the PTO shaft connection (540 rpm) of your tractor as drive mechanism. The Cardan shaft is included in delivery! The cable-hose assembly for the control valve with control levers is long enough for you to be able to install it in a suitable place on the tractor, which you can easily reach. Attachment is onto the rear three-point Kat. 1 of the tractor with a PTO shaft rotational speed of 540 rpm. 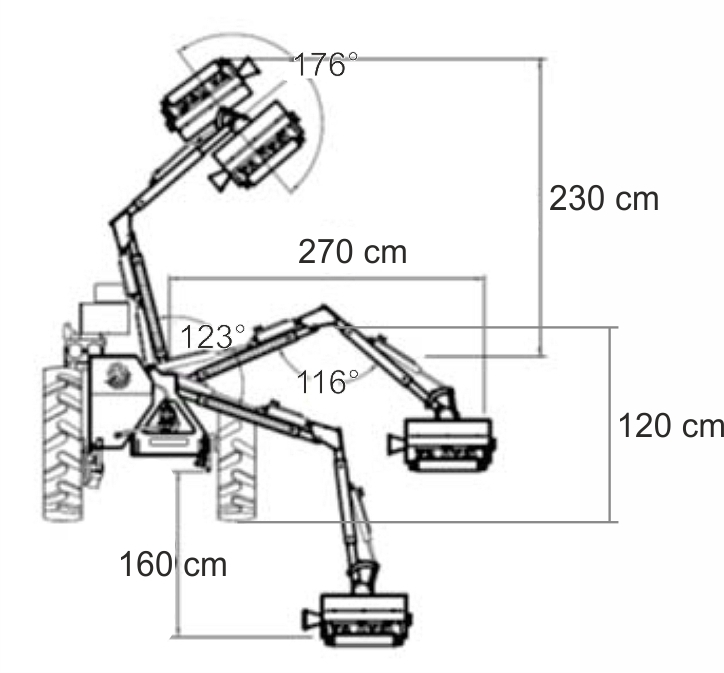 The height adjustable trailing roller on the rear of the mulcher and height adjustable runners enable control of the cutting height. Due to the lightweight, these mulchers are specifically suitable for compact tractors 25HP and up.